On October 11, 2017 the EPA ordered the full removal of dioxin-laden waste pits just outside of Houston on the San Jacinto River. Big companies like Waste Management Inc. and International Paper are now on the hook for as much as $115 million. You read that correctly: the current EPA, headed by Scott Pruitt–who was appointed by Donald Trump–went against corporate power and took the environmentalists’ side in a major dispute. It’s a testament to incredible organizing from TCE’s allies, an effort we were honored to help. 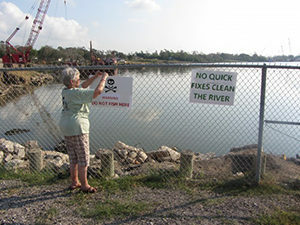 In the 1960s a paper mill in Pasadena, Texas sent their wastes to open pits at this location, disposing of highly toxic materials including dioxins. Over the years groundwater pumping has caused the ground to sink (subside), bringing the pits partially underwater. High tide and flooding events have further inundated the site, putting many of the most dangerous materials under the water. Maybe the worst nightmare of them all came when EPA finally revealed the results of their post-Hurricane Harvey testing at the site. Dioxin is one of the most dangerous carcinogens known to science, and testing after Harvey showed some parts of the site to have dioxin levels at 2,300 times the level considered safe by the EPA. It’s one of the worst pollution situations we’ve heard of in this state’s history. But neighbors in the area have been undeterred at any step in this multi-year process. 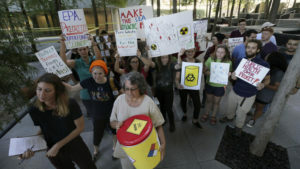 They won the support of their members of Congress and thousands of people in the Houston area wrote letters, compelling even one of the most environmentally compromised EPA leaders in history to go against the big businesses and with the public interest. The order for full removal is a landmark victory for our state and for our movement. Unfortunately the federal and state programs meant to clean up sites like this one–including the Superfund program–are broken. The San Jacinto waste pits are the exception, and even that site may end up polluted for many more years while corporate attorneys and lobbyists take advantage of the failing program meant to hold them accountable. TCE is committed to building a long-term, multi-faceted campaign to fix our state and federal cleanup programs. This means making cleanup a priority, making polluters pay for these cleanups, engaging the public at every step along the way, and putting human health and the environment ahead of developer profits. We will still be working on better recycling and composting for our communities, and fighting a variety of other fights as they come up. But what our allies in Houston have done is given us a proof of concept. When Texans press their local and federal officials they can make even anti-environment decision-makers do the right thing for our land, water, and air. We need your help providing that pressure as we step into this battle.